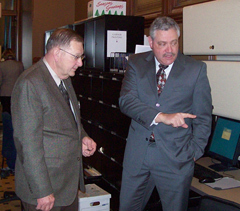 Representative Mark Smith of Marshalltown, on right, gives Curt Hanson, on left, a tour. Two of the 150 legislators who have gathered at the statehouse this morning are rookies. Curt Hanson of Fairfield was elected to the Iowa House in a special election in September. Kirsten Running-Marquardt of Cedar Rapids also won a special election, in November, for a House seat in Cedar Rapids. Hanson admits to a few butterflies on this opening day of the legislative session. Running-Marquardt admitted to being nervous as she was interviewed by a handful of statehouse reporters. Running-Marquardt’s father was a legislator and she remembers visiting the statehouse as a child, listening to debates, but that familiarity still didn’t dampen the those jitters when she walked in this morning. Photographer Bob Nandel snaps a photo of Kirsten Running-Marquardt. Both Hanson and Running-Marquardt are Democrats. The Iowa House and Senate began this morning shortly after 10 o’clock with prayers, then ceremonial speeches. 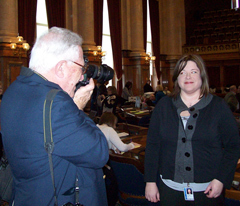 Mark Willemssen, facilities manager for the Iowa General Assembly, was one of the people who’s been working behind-the-scenes since December to spruce up the statehouse for this opening day of the 2010 legislative session. For example, the massive chandeliers which hang in the House and Senate were lowered, they were cleaned and all the light bulbs were replaced, as the fixtures are lowered just once a year, just before legislators return to conduct business in the House and Senate. Here are today’s opening speeches from legislative leaders.